“Sullivan & Son” has closed its doors. After three seasons, TBS on Nov. 20 canceled the sitcom co-created by Korean/Irish American comic Steve Byrne, who starred as a corporate lawyer who gives up his job in New York to take over his parents’ working-class bar in Pittsburgh. The cast included Jodi Long as Steve Sullivan’s mother, Ok Cha; Dan Lauria as Steve’s father, Jack; Vivian Bang as Steve’s sister, Susan; and Owen Benjamin, Brian Doyle-Murray, Christine Ebersole, Valerie Azlynn, Roy Wood Jr. and Ahmed Ahmed as Steve’s friends, all regulars at the bar. Executive producers were Byrne, actor Vince Vaughn, Peter Billingsley and long-time “Cheers” producer Rob Long. She explained, “Besides being a very funny show with four comedians and phenomenal seasoned comic actors, one would think that in the age of Obama with all this talk about diversity, and the broad range of race, age and gender that our show encompassed, we would have been touted more for putting forth what everyone pays lip service to these days. 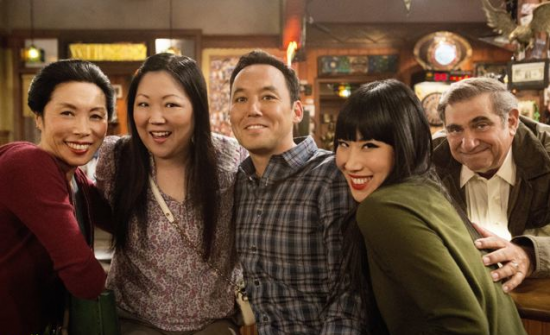 Long also played Margaret Cho’s mother 20 years ago in the ABC sitcom “All-American Girl,” and one of the highlights of “Sullivan & Son’s” last season was a reunion with her TV daughter, this time playing her niece. Long sometimes get recognized on the street, even though she looks very different from her character in real life. “A few months ago I was crossing a street in my neighborhood in New York City. I was jaywalking, actually, at a busy intersection. Everyone does it there and it’s not an issue like in California. There was a traffic cop standing on the corner of the intersection. Long, who also has extensive stage credits, recently finished the run of a new play, “The World of Extreme Happiness” by Frances Ya-Chu Cowhig, at the Goodman Theater in Chicago. Trudie Long, a Nisei from Portland, Ore. who was interned in Minidoka, Idaho, passed away a few months ago.